Over the last week, Pradeep Taneja, who lectures on international relations at the University of Melbourne in Australia, toured Korea and witnessed its sound economy and tense security. 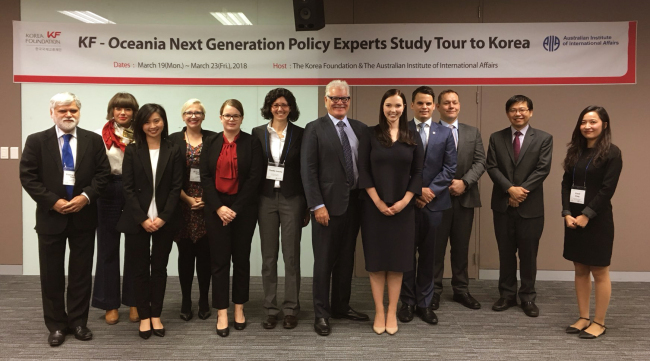 Taneja, along with 10 scholars and researchers from Australia, visited the Ministry of Foreign Affairs and Ministry of Unification, National Assembly, National Diplomatic Academy, Australian Embassy and Asan Institute for Policy Studies, among other destinations, in a program jointly organized by the Korea Foundation and Australian Institute of International Affairs. “I especially benefited from interacting with officials from the Ministry of National Defense and Ministry of Foreign Affairs, as well as scholars from the Asan Institute and National Diplomatic Academy,” Taneja, whose research has focused on China and India and the relationship between democracy and development, told The Korea Herald. Joining Taneja on the trip, titled “Next Generation Policy Experts’ Study Tour of Korea,” were John Goodlad, a former Australian diplomat and president of the Australian Institute of International Affairs; Sow Keat Tok, a research fellow and lecturer at the University of Melbourne’s Asia Institute; Claudia Astarita, a nonresident fellow at the Asia Institute; and Bec Strating, a lecturer of politics and philosophy at La Trobe University. Noting that Australia and South Korea are both middle powers relying on their diplomatic and security partners to protect and advance their interests, Taneja argued the two countries can achieve “much more” by working together and with other states across the Indo-Pacific region -- a concept describing the evolving economic order surrounding the Indian Ocean’s tropical waters, the western and central Pacific Ocean and the Southeast Asian seas. “The Indo-Pacific concept, about which Korea still seems a little wary, will help countries maintain a balance of power in this important region, while contributing greatly to the global economy,” he said. “Australia is Korea’s like-minded country with shared interests and values. The Korea Foundation has ensured that there is another generation of Australians who understand the country and can share their deeper knowledge after returning home,” he said. Korea Foundation President Lee Si-hyung, a former South Korean diplomat, said advanced countries have long invested in public diplomacy significantly. The Japan Foundation has an operational budget five times Korea’s, and China has established Confucius Institutes in over 500 places worldwide, he mentioned. “Although South Korea lags behind advanced countries and our neighboring countries in terms of operational budget, our program has concentrated on opinion leaders in various countries, helping them form a balanced view on the Korean Peninsula that incorporates our national concerns,” Lee explained. Over 170 people from Europe, Southeast Asia, Oceania, Russia, Japan and China have participated in the program since it began in 2015.